A framework for developing a whole-of-university approach (the full framework can be downloaded here). 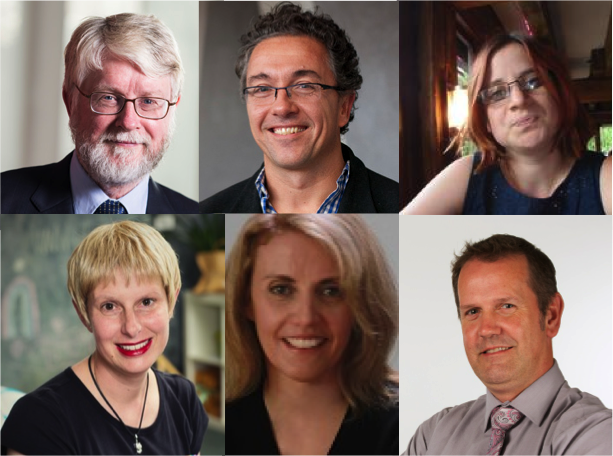 A podcast discussion of university-related issues, drawing on academics, higher education experts, and students’ experiences; as well as an interview with higher education experts. Links to other useful whole-of-institution frameworks and policies in other contexts that have guided the development of our own framework. Professor Raoul Mulder interviews Professor Glen Bates (Swinburne) and Mr Matt Brett (La Trobe) about whole-of-university issues. Student mental health and wellbeing is supported when curricula and learning experiences afford choice and flexibility in approach, create social connections, build competence and foster intrinsic motivation. Research indicates that student mental wellbeing is supported when curriculum and teaching practices foster students’ intrinsic interests, and communicate the importance and value of the knowledge and skills being developed. 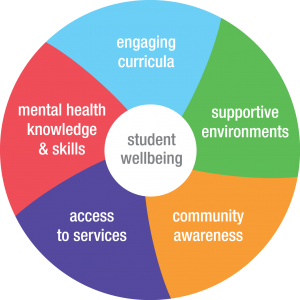 Student mental wellbeing is also supported when curricula design and learning experiences build students’ self-efficacy, afford choice and flexibility in approach, and create social connections – among students, and between students and academic teachers. Engaging curricula and learning experiences understand the needs of diverse students and adopt teaching practices that best support their learning. Curricula and learning experiences that engage students in these ways are known to enhance students’ sense of purpose for their studies and sense of belonging or connectedness to the institution. Ensuring that students who may be experiencing mental health difficulties have access to appropriate services and academic adjustments requires not only that those services are in place but also that barriers to access (awareness and perception) are addressed. Mental health difficulties and mental illness are surrounded by misunderstanding and stigma. This impacts the treatment of and responses to individuals who experience such difficulties; it also affects individuals’ acknowledgement of mental health difficulties when they arise and decisions to seek help or access support. Proportion of students applying for special consideration related to mental wellbeing. All students should have opportunities to develop mental health knowledge and skills within their academic course of study. While many students thrive at university, it is now known that a significant number experience mental health difficulties and struggle to manage the demands and pressures of their academic studies. These students need timely, personalised opportunities to develop relevant skills, such as time and task management, reflection and self-understanding, self-regulation, goal setting and help-seeking. There is a growing of body research showing the benefits of integrating mental health skills education in the university curricula, in particular in helping students develop self-management skills, mindfulness and resilience (see Veness, 2016). These skills have also been linked to employability, and universities are increasingly including self-management and other skills related to wellbeing as learning outcomes in graduate attribute statements. Providing opportunities within the formal curriculum for students to learn health promoting knowledge and skills – such as resilience, conflict resolution, emotional intelligence, mindfulness, and time and task management. Developing strategies for students with histories of abuse, discrimination or trauma to engage with potentially distressing curriculum materials. Availability and take-up pf programs and information that build reliance and self-management. Availability of explicit guidelines/resources for academic staff teaching potentially distressing curriculum materials. The social, physical and virtual environments for student life and academic engagement play a significant part in promoting or undermining student mental health and wellbeing. Empirical studies have identified social isolation from other students and lack of a sense of belonging to the institution as strongly associated with mental health difficulties. It is essential to create social, physical and digital environments that are strongly inclusive, promote respectful interactions and relationships, and meet people’s daily needs. Visible presence (e.g. office space, web presence) of student liaison officers for student equity groups – indigenous, LGBTIQ, mature age, students with disabilities, international students. Mental health and wellbeing is supported when individuals within a community have the information and abilities needed to identify options and make decisions and choices conducive to good health. As identified in the Ottawa charter, health promotion works through empowering affected communities to take ownership and exercise agency in setting priorities, making decisions, and planning and implementing strategies to achieve better health (WHO 1986). For universities committed to better supporting student mental health, this means actively building the capacity of, and creating opportunities for, students and student organisations to effectively initiate, develop, contribute to and sustain activity and decision-making related to student life in general and student mental health and wellbeing in particular. Resources, programs and activities to strengthen awareness of mental health among all members of the university community will help to support student mental wellbeing.